I was driving the Road to Hana in Maui in April and telling my wife how great the Garmin was working in our Jeep. I insisted that we should both get one when we get back to Jersey and she even named the Garmin “Cathy” while on the island. We used it to find Costco, Mama’s Fish House, our surf and snorkel gear and an Outback Steakhouse. The thing was awesome and so accurate. 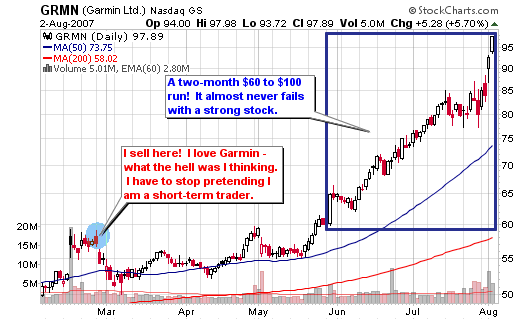 It was April and Garmin was a stock I just sold for a small 15% profit on a short term trade. What the hell was I thinking? These are all things I attempt to follow with every trade. I went through a phase where I wanted to become a short term trader but realized that it wasn’t for me, not at this time. So, I looked in the mirror and admitted that I do my best work when trading longer term weekly trends. I am not TraderMike or Charles Kirk. This “short-term” strategy seemed to make me some money earlier in the year when I quickly grabbed that $15% gain in GRMN, selling at the top of a gap-up. I nailed it; sold at the top and walked away a winner. WRONG AGAIN (this seems to be happening a lot this year: leaving profits on the table). I admit that it’s been a great year but I left this home-run on the table and only took down some scraps. My profits from February could have increased another 4 times had I stayed in the position patiently. a 12R GAIN! – Home RUN! Garmin was a prime candidate for the $60-$100 run that I so often target, a run that I followed heavily for dozens of stocks on MSW over the years. I lost my focus on this stock and it cost me a lot of money (not in losses but in regrets). 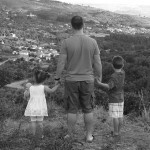 Anyway, here is some of the Garmin (GRMN) coverage that I posted to the blog over the past year. The stock also appeared on the MSW Index many times in 2006 and 2007 (before I closed it down in March). I saved the portfolio $4,000 in profits from my sales on Friday and Monday (GRMN and SLW). GRMN – $49.69 -sitting on the 200-day moving average! GRMN – $47.18 ($95.35) down over 2% for the week but the stock continues to hold the 50-d m.a. as support while maintaining a presence near the psychological triple digit threshold. I still like the stock in a rallying market (could make a nice option play for a solid run). Looking at the MSW Index, we see that every stock fell for the week, so which ones dropped the least? GRMN – $49.12 ($99.26), These were the only qualifying stocks from the MSW Index that fell less than the major indexes. 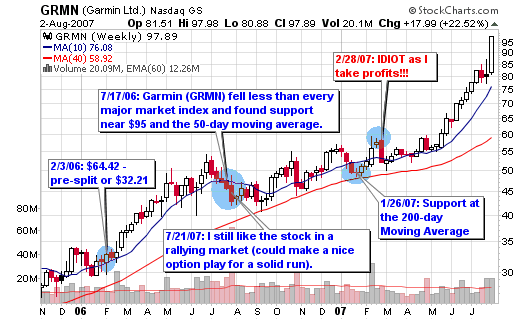 Garmin (GRMN) fell less than every major market index and found support near $95 and the 50-day moving average. It did qualify for distribution, the first in 13 full weeks. Great post! Your blog is quickly becoming one of my favorites. What’s your email address, I would like you to join our fantasy football league. True. But could you have made the same amount of money doing short term trades in the meantime? Keeping the money active in other stocks instead of a stock that fizzled for a while? I’m in a league already but I think I can handle another. I see the info on your site so I will let you know. What you say is true as well but I do like to keep the commissions down as well as any chance for slippage and the like. Risk rises and profits are eaten away when I over-trade. A good post but the biggest question remains unanswered: when would you sell? Profits are easy to make in hindsight but this ignores all the decisions that need to be in the trenches while managing positions. Once your target was hit you would have rode it all the way back down without raising the stop? Since you call it a “homerun” if you kept it till now does that mean you sell now? Its a tough call between overtrading and watching profits disappear!